Its been a while since I have written a budget lehenga on rent blog post. I am huge believer of saving money wherever possible so finding Bridal Rental Lehengas Under 10k is kind of like a personal mission of sorts. If you are a bride with a budget of INR 30k or under, I would highly recommend opting the rental way instead. There are so many good websites out there where you can rent designer lehengas at crazy amazing prices. I have said this time and again. It’s a pain post wedding to take care of bridal lehengas. They are so bulky, heavy and you really can’t wear it in all it’s glory in anybody else’s wedding. More like you shouldn’t. So what’s the point of dropping a big sum on it only to regret it later. In case you are in two minds of buying vs. renting a wedding lehenga, here are my top Bridal Rental Lehengas Under 10k from Flyrobe. All of these lehengas can be rented through Flyrobe. You can also note down the designers and see the original lehenga prices. In case you can get a hold of the store/designer, you can opt to buy the lehengas as well. This magnificient ensemble is finely crafted with raw silk and comes with the cream blouse featuring deep round neckline, short sleeves, backless cut with dual dori tie-up with pretty latkan. It is teamed with red floor length kalidar flared lehenga with broad cream hem border and dangling latkan tie-up on the side. It is completed with red soft net embellished dupatta. The robe is enhanced with gold zari, resham thread & gota work in intricate floral & traditional design motif all over. I have no clue how this is so inexpensive. I mean we are legit Anita Dongre Lehenga. The rental price of this bridal lehenga is on flat 50% discount for just INR 4000 !!! If you are new to Anita Dongre lehenga prices, you should know that a heavy Gota-Patti lehenga from the designer can set you back anywhere between INR 3 Lakhs to INR 6 Lakhs. That’s usually how much these gorgeous lehengas cost. If you have been crying over getting a premium designer lehenga on discount, there is no better place that to pick this up. These bridal lehengas original price is in the INR 20k range which if you ask me is pretty great on its own. Definitely buyable as well. The only problem is I don’t know for sure if you can ask for the lehenga with cancan, because then it would just change the game altogether. The lehenga work is pretty nice for the price and with the right amount of volume under the skirt, the look can be fabulous. Tomato reds are my current favourites for bridal lehengas this season. You can just never go wrong with shades of red. They look great on every skin tone, and are symbolic of Indian Weddings. Tomato red is a fairly new shade that’s been trending for awhile now. You might have seen some of the Anita Dongre Gota Patti tomato red lehengas. I happened to see a few during the Vogue Wedding Show 2018, and they looked absolutely breathtaking. Here are some other red lehengas from Her Closet that are good rental buys. Now, some of you might say is this blog post only about red bridal lehengas? Well, no not exactly. But this is the best I found in the price range. Lower the price, the better, right? But, there are a couple of pastel heavy embroidered lehengas that are totally bridal. Here’s some of my favourites. Pastels are great for day weddings. If you’re having a beach front wedding or just love pastels in general. Then these are some of the most affordable heavy work bridal lehengas you will find in the market. I mean just think about it. These days we end up spending INR 3000-5000 on regular casual wear sets. This is bridal we are talking about. Getting something good in under INR 5000 is crazy good bargain. When I first started framing this blog post, I didn’t know that the brand Her Closet will have so many good budget lehenga options. I only wish there were more colours in bridal range than that of the usual reds and pinks. But that said, the price is unbeatable anywhere else so not much to complain, right? If mainstream bridal wear is not your thing, take a look at this designer label Trinesha. I loved the orange embroidered lehenga in particular for its loose sleeve design. It’s unique and looks quite fashionable with the otherwise traditional lehenga. If your budget is slightly more than INR 10k, then Niyoosh is a good brand to check out. They have a range of heavy bridal wear lehengas in the INR 12-15k range in all different colours and fabrics. 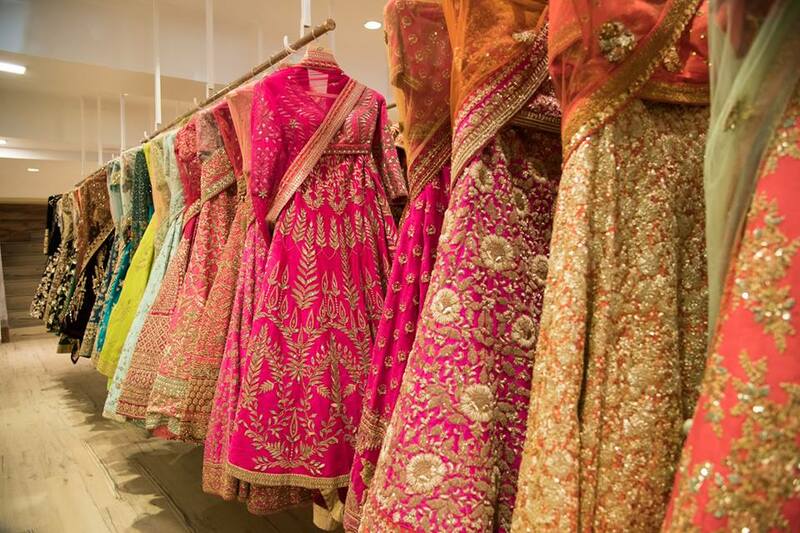 Which Bridal Rental Lehengas Under 10k was your favourite?